Holiday.gr - Arillas, a trip to a myth! 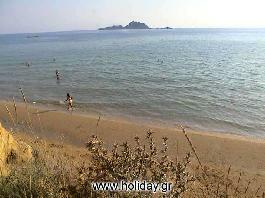 The coastal settlement of Arillas is located in the northwestern part of Corfu 38km from the city. It distinguishes for its extraordinary beach that has been awarded with the Blue Flag. It is a long beach with sand that hasn’t been glutted with tourists and keeps its natural beauties. Staying in Arillas is ideal for those seeking for some privacy and calm. Been to Arillas ? Share your experiences!